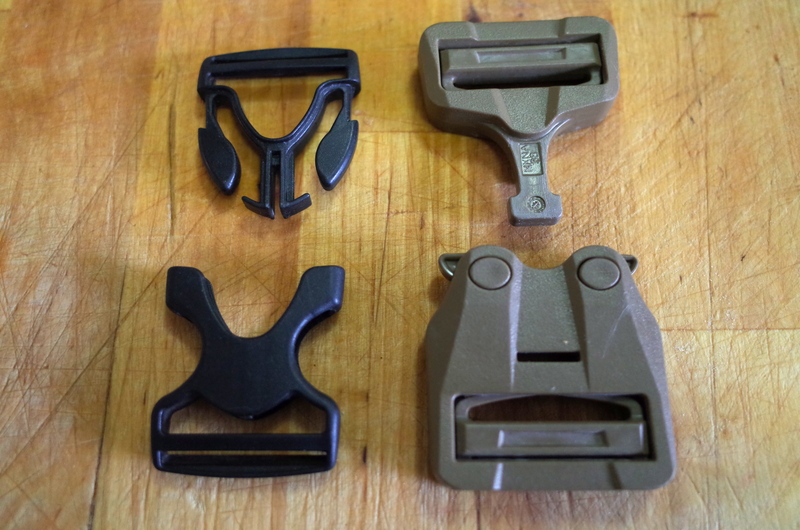 Backpack hipbelt buckles, not something most think about, until one breaks. Which is exactly the point: across the past two decades I’ve broken backpacks in only one of two ways, wearing holes via abrasion, and breaking the prongs on buckles. Usually the later happens when someone steps on it, and while a busted compression strap can be annoying, a busted belt buckle can on a remote trip with a heavy pack be a disaster. One of the only things I add to my emergency and repair kit on a long trip is an extra 1.5″ hipbelt buckles. Back in the day I built one into the top strap to have an integral extra, but that proved clumsy. Enter the ITW Cobra buckle. Based off a metal military model, the Cobra is meant to be unbreakable, and based on using one for the last year I’d say that is appropriate. I appreciate that rather than remembering to add an extra buckle to my pack, and have something else to keep track of, I can use a cobra on my big pack and not give the matter any further thought. 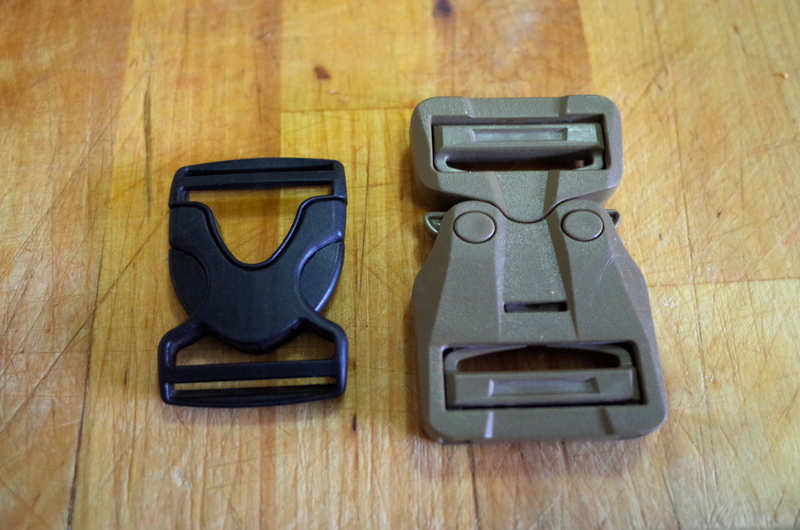 Imagine the cobra buckle as a face. The ears operate cams within the buckle which grad the protrusion on the bottom of the male side of the buckle. Move the ears up and the buckle releases. Simple and effective, even in snow and ice. The disadvantage of the cobra are the size, cost, and weight, in that order. It is bulky, and does poke me in the gut upon occasion. Even if my diet relied less on beer and frozen pizza than is currently the case, I still think this would be an issue. The cobra also costs a lot, nearly 9 dollars for both pieces, compared to just over a buck for the sleekest 1.5″ scherer/osprey cinch buckle. The cobra is also 4-6 times heavier than the smaller 1.5″ buckles. Is it a necessary piece of equipment? Absolutely not, but it is one I appreciate for the simplicity and longevity it brings to long trip, heavy load packs. 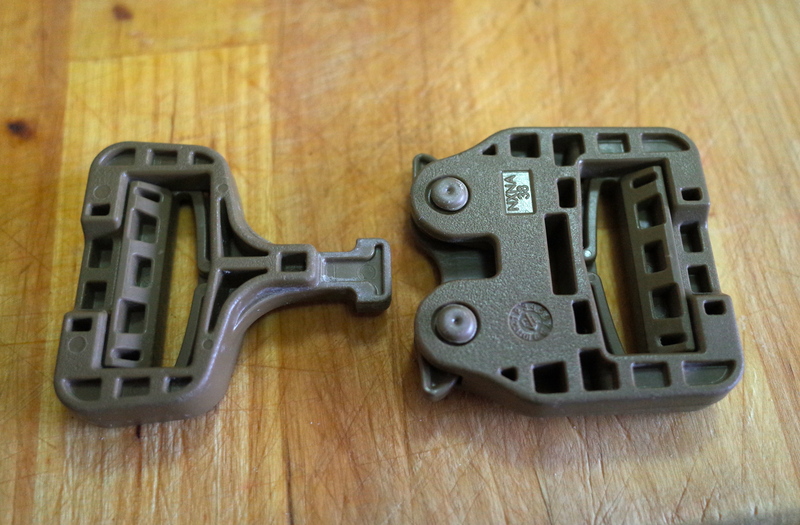 Sand does not play particularly well with these buckles in case getting down and really dirty is your jam. They dont do well at goruck events then? Missed this comment somehow. Yes, my beta on those buckles is from GR participants. I built one into a belt I wear from time to time but never anywhere grueling. Thanks Sam. I’ve wondered if drilling out the “mouth” would provide a way for debris to egress.